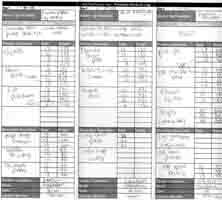 What is a Exercise Log Sheet used for? A free printable exercise log is very important for all personal trainers or anybody who exercises to use a daily exercise log to keep track of all physical activity. It not only serves the purpose as a reminder telling yourself what has been working and what does not work, but allows you to constantly tweak your workouts. Constantly tweaking your workout routine can help you create the best workout for your specific goals because you eliminate everything that does not work and have everything which works. NOTE: You may need to change your printer settings to print correctly. Set paper to landscape and all margins to 0 before you print the following free printable exercise log sheets. Exercise log sheet for 3 workout days. You can also download a 4 Day Printable Workout Log. Print out both on each side of a piece of paper and you will have a full 7 days of workouts. You should be able to fold the paper in equal sections for easily portable, small exercise sheets which you can store in your pocket while you workout. 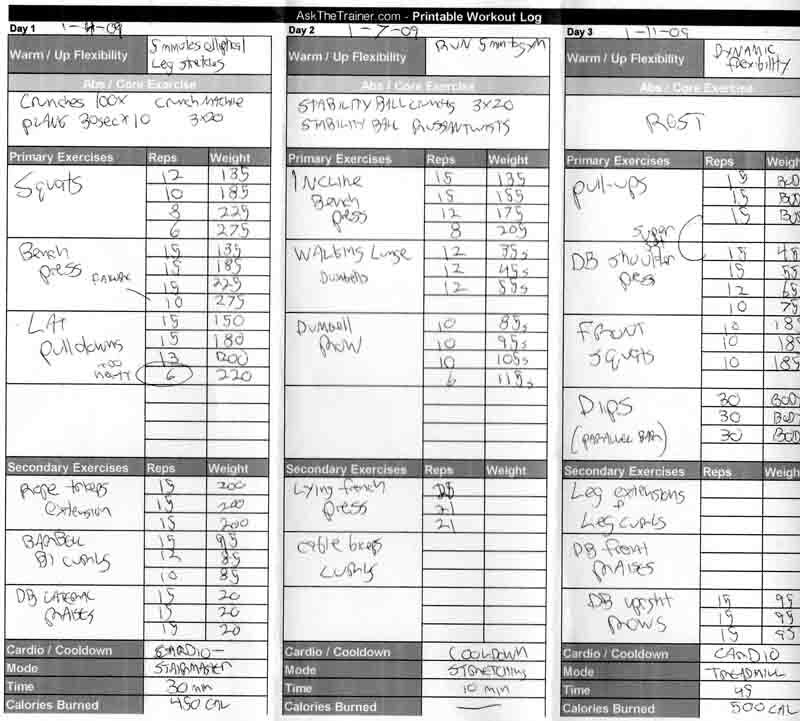 A sample exercise log filled out with random exercises and weights. This is just an example of how to use each free printable exercise log. Notice that the the weights and reps for the primary exercises is accurate with notes while the secondary exercises are missing information? 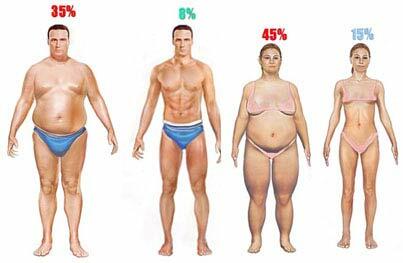 This is because your primary exercises should be kept track of meticulously so you know if you are making progress. These should be the base exercises of any exercise program. The secondary exercises not even necessary for most people. The weights are not important to keep track of for the secondary exercises because they are effected by the previous exercises which work large muscle synergies. A log sheet for cardiovascular exercise is to track your daily cardio activity from structured periods on any type of cardio machine to aerobic activities of daily living such as running to catch a bus. It is important you track every little bit of activity because it all adds up to more calories burned throughout the day. 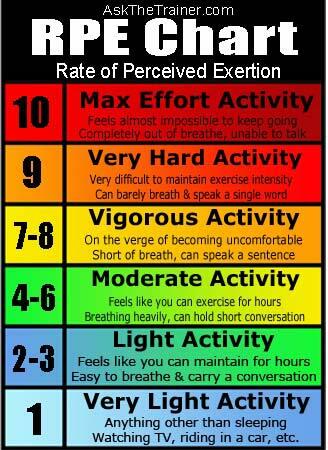 Your RPE is also important to keep track of because you can see if you are working as hard as you should be or maybe too hard that you cannot maintain the exercise for long enough duration. 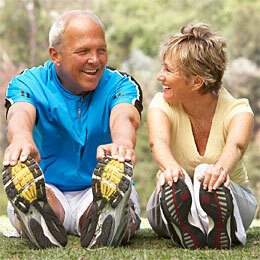 Your daily exercise log contains space for all your physical activity during the day. This includes workouts and normal activities of daily living. You have an Exercise Log Sheet, Now What? Next is the rather complicated task of creating an effective workout which is consistent with your goals. 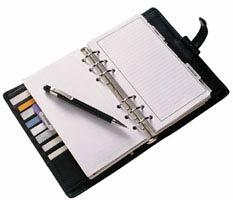 The first thing you should do is write down your own information so you can see it on paper. How much time can you realistically set aside for exercise? If you have enough free time to workout 7 days a week do you really want to? You must be aware of everything that will effect your training program before you print and fill an exercise log sheet and begin to fill it out. Find over 300 exercise videos with audio instructions and form tips. Use these how to instructional videos to fill your free printable exercise log sheet. Click on the anatomy chart or piece of gym equipment to find all the exercises you desire in the exercise video library. Learn not only how to perform the exercises but the methodology of exercise selection and order of exercises for the best workouts. How to perform each exercise to most importantly be safe and avoid injury and also to accomplish your physical fitness goals more efficiently. Just how much work do you need to perform to get the most benefit out of your workouts? Learn how to know whether you are performing enough sets and reps to accomplish your specific fitness goals that you have set and written down. If you plan to work out more than twice a week or consecutive days, training splits are important to ensure you do not over train certain muscles and have full body balance in your exercise program. Learn the ins and outs of creating proper workouts which will help you put everything you have learned together so you can fill out your free printable exercise log sheet accurately and completely. If you would rather have someone such as a personal trainer design your workout for you, your professionally designed workout would likely use a similar form as the free printable exercise logs we provided you earlier in this article. After your trainer provided you with your customized workout program, from there you can learn to eventually create your own workouts. Get a workout routine created for yourself and or a friend and your program would be designed for the exact equipment which you have access to and for your very specific personal goals. If you have any questions about how to fill you exercise log sheet properly you can have them answered by an expert certified strength and conditioning specialist and certified personal trainer.